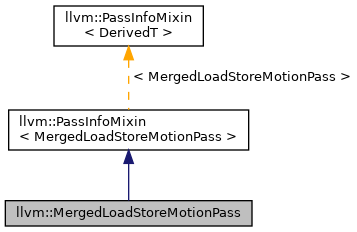 Definition at line 30 of file MergedLoadStoreMotion.h. Definition at line 387 of file MergedLoadStoreMotion.cpp. References llvm::PreservedAnalyses::all(), F(), MergedLoadStoreMotion, llvm::PreservedAnalyses::preserve(), and llvm::PreservedAnalyses::preserveSet().